Kshitizz Baniya is a talented and gifted young man. His intricately-detailed artwork and drawings are admired by everyone who catches a glimpse. At the age of nine, his artistic talent began to bloom at Navjyoti Center, where the Sisters of Charity of Nazareth empower students who have learning challenges and differences. From birth, Kshitizz has dealt with hearing loss, with only 20 percent hearing in one ear. When he first came to Navjyoti Center, it was difficult to connect with him. Through their continued efforts and through drawing, Sisters and staff learned to effectively communicate with him. Located in Kathmandu, Nepal, under the leadership of Lisa Perekkatt, SCN, 70 children come daily to this dynamic learning center to meet with the caring, highly-qualified faculty. At the school, Kshitizz slowly developed his talent and blossomed into the artist he is today. In addition to the program at Navjyoti, he attended art class once a week where he learned sketching and how to draw faces. Most of his drawings are things that interest him. At one time he was drawing detailed replica airplanes from different countries. Then he began drawing birds, fruits, and vegetables. 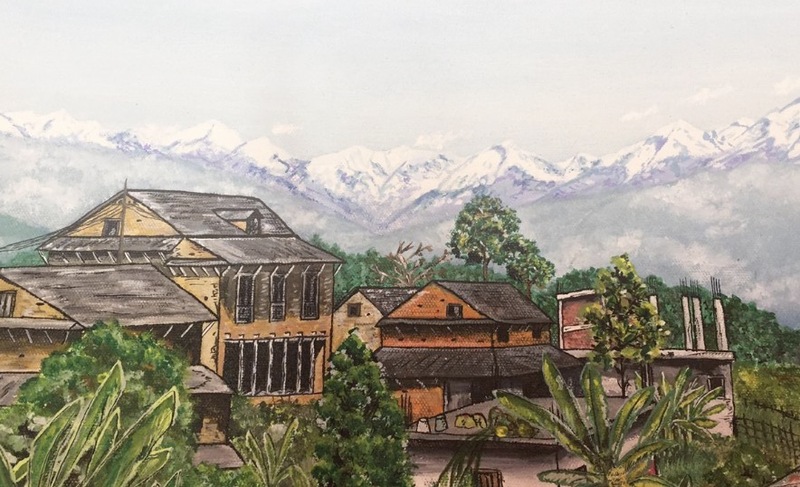 Now he is drawing scenic landscapes of Nepal and India. She had the opportunity to meet with him while visiting Nepal last Spring. Sister Sarah marvels at how hard he works at his art as well as the packaging he makes to sell his artwork. All that Kshitizz embodies is ultimately the goal of Navjyoti Center – to equip the students with the tools, skills, and confidence they need to become independent learners, to succeed in school, find fulfilling careers and lead balanced lives. The Sisters continue to nurture his talent, so that it may support him in the future. “On a few occasions we have found professional short-term assistance for cultivating his drawing and painting. However, it is through his own efforts that he has come this far,” says Sister Lisa. The days at Navjyoti Center begin with yoga and prayer. Each child has a curriculum designed individually for their own learning style. Sister Lisa and her staff use academic, behavioral, and social strategies blended into a program comprehensively designed to educate the whole student. Kshitizz excels at most things he tries. He is a gifted athlete, taking home gold medals for the school in sporting events. He enjoys dancing. With minimal hearing, he is able to concentrate and truly listen to music. Recently he learned cycling and is making crafts alongside his artwork. “Whatever he takes on, he is perfect at it,” says Sister Lisa. The happiness and well-being of every child of God is at the heart of the mission of the Sisters of Charity of Nazareth. With each stroke of his pen or brush, Kshitizz helps complete a picture where a future of dignity and equality is realized. Thank you for encouraging the talents of each young person… might prints of Kshitizz’s work be available for purchase? A cooperative might bring funds to support ministry. Thank you for including pictures of Kshitizz’s art work. It is lovely. The program sounds like it really enables each student to achieve in their own area. Thanks go out to every teacher.